Naim NAC-N 272 review | What Hi-Fi? There are only two things you need to know about the Naim NAC-N 272: it’s a fully featured streaming preamp and it sounds lovely. We could conclude what would be the shortest review in What Hi-Fi?’s 40-year history right here, but that would leave us a rather blank page, so let us elaborate. Streaming preamp? This may not seem particularly special. After all there isn’t a shortage of music streamers that also have a volume control. The NAC-N 272 isn’t like most of them though. It uses a fully analogue preamp section, much like the designs seen in Naim’s more upmarket offerings, so performance through the analogue inputs – one DIN and two RCAs – has the potential to be really good. Most rivals tend to prioritise the digital circuits, leaving the quality of the analogue section distinctly second best. That certainly isn’t the case here. Naim has long been a fan of DIN connections, believing that they sound better than the RCA alternatives. There was a time when the company’s products only sported DINs, but thankfully this attitude has become far less dogmatic over the last decade and a half. This is also a forward-thinking unit, so there are digital inputs. There’s a good range of optical and coax connections alongside aptX Bluetooth. Bluetooth would have been unthinkable in high-end products just a few years ago, but now an increasing number of manufacturers are waking up to the fact that wireless connectivity is a good thing. MORE: AptX Bluetooth HD: What is it? How can you get it? Naim being Naim, a great deal of engineering has been undertaken to avoid such features spoiling the sound. The digital and analogue sections communicate through optical isolation chips to minimise any interference. As is usual for the company, plenty of care has been taken in getting the circuit layout right and the power supply arrangement just so. Even so, the N 272, like other Naim products, is easily upgradeable through one of the company’s outboard power supplies. These aren’t cheap – starting at £1800 for the XP5 XS, all the way up to £6k for the 555PS – but in our experience the sonic improvement tends to be obvious. The unit’s outputs mirror the connectivity of the analogue inputs by offering both DIN and RCA option. There’s also a line level output if you want to use the NAC-N 272 as a stand-alone streamer and plug it into your existing amplifier. This is a well-specified unit. It’ll stream at a maximum of 24-bit/192kHz across your network and handle DSD 64, should you have such files. All the main file formats are covered from FLAC and AIFF right through to Apple Lossless. Spotify Connect is built-in as is native support for Tidal, and if that isn’t enough then there's the big wide world of internet radio to enjoy. Analogue radio fans haven’t been forgotten in the fast-flowing current of streaming; there’s an optional DAB/DAB+/FM module available too. Build quality is as solid as we’ve come to expect from Naim. The N 272 doesn’t feel particularly luxurious but does give off a no-nonsense air that suggests a focused, well-engineered design. The front panel control count is low for a product like this, and is backed up with a clear display that’s large enough to read from across a room, even in bright lighting conditions. The N 272 is straight-forward to set up. Its menus are easy to use and it connects to our network swiftly. While going wireless is an option we always prefer going the wired ethernet route as it intrinsically offers greater stability. While Naim supplies a standard remote with the 272, we think users will be better served with the company’s control app. This has gone through numerous evolutions and on the whole works well. Android and iOS versions are available, and there’s no great difference in performance between them. The app is well laid out and pretty easy to use. Our review unit was supplied with a NAP 250 DR power amplifier. At £3500 it’s a logical partner, as would be the more affordable, lower-powered NAP 200 DR (£2050). While the 272 is more than happy driving alternative power amplifiers – it works well with our reference Gamut D200i, for example – we suspect that the vast majority will find themselves in an all Naim set-up. We have no issue with that, as such combinations ensure compatibility, not only in electrical terms, but when it comes to sonic character. During the review period we used a range of speakers from our reference ATC SCM50s right the way through to the PMC Twenty5 22s and Dynaudio Emit M20s. None throw up any compatibility issues. We left the Naim running for the best part of a week before we started serious listening. It’s worth waiting as the sound becomes clearer and more fluid over time. Once up and running the NAC-N 272 turns out to be a superb performer regardless of source. We start with Bluetooth and found the wireless connection to be swift and stable. Using a Sony Xperia Z3 as source we’re happy to report that the Naim delivers a surprisingly cohesive and insightful performance. Listening to Jill Scott’s Family Reunion is fun. We like the way this Naim renders the song’s easy-going beat and the presentation’s balance between attack and refinement. There’s little sign of the lack of subtlety and thinness that Bluetooth can still suffer from, and the tonal balance is just that, balanced. While we wouldn’t use this connection for any serious listening it’s great for a casual dip. We’re familiar with the quality of Naim’s streamers – our reference unit is the range-topping Naim NDS/555PS combo – so it comes as no shock to find the streamer section of the N 272 is a good one. It’s a surprisingly talented performer, keeping the balance of Bluetooth but adding sizable chunks of transparency, subtlety and rhythmic precision to the mix. We played a whole range of music from the complex instrumental weave of Hans Zimmer’s Interstellar right the way through to Kendrick Lamar’s hard-hitting How To Pimp A Butterfly. The Naim delivers across the board. With Interstellar, it generates an impressively large-scale presentation. The music’s huge dynamic sweeps are supported by rock-solid bass that has plenty of authority without sacrificing definition. We love the way the 272 communicates the insistent drive of Coward – it’s determined and surefooted – and that simply reinforces the menace and excitement of the track. The Naim doesn’t deliver the most open or spacious sound stage, but it is nicely focused and crisply layered. Importantly it stays focused even when the piece becomes demanding. Moving to Kendrick Lamar’s set shows off the NAC-N 272’s direct delivery. While there’s plenty of insight and subtlety we’re drawn to the highly organised way this unit renders music. Every note and sound has a distinct place and purpose and through the Naim it all makes sense. It’s this ability to organise, and the stability that goes with it, that makes the 272 such an impressive performer. Rhythmically it’s strong, making the most of hard-driving tracks such as King Kunta. Despite a strong dose of refinement, the 272 has plenty in the way of bite to convey the attitude of the music well. The analogue line stages and built-in DAC are equally impressive, preserving the unit’s sonic character while being revealing enough to show up the sonic differences between alternate sources. We would happily put the Naim’s preamp section up against any stand-alone rival in the £1000 to £1500 price range without fear. The DAC section would be one of the better performers below the grand mark. The headphone output is as good as the line stages – something that isn’t usually the case. It’s a Class A circuit designed to drive a wide range of headphones well, and it does. We tried various samples from the Beyerdynamic T1s through to Grado PS500s without issue. 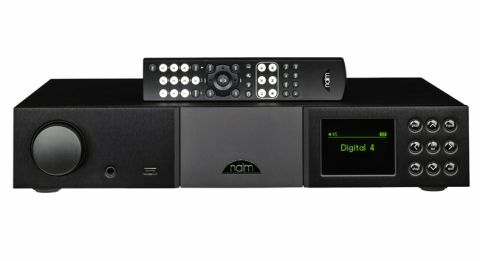 The Naim NAC-N 272 could have easily turned out to be too much of a compromise; a poor relation to the company’s long established line of dedicated separates. It isn’t though. It sounds great, it’s full of life and has the ability to make music, no matter how complex, make sense. Then factor in the box-count reduction, lack of extra cabling and the fuss-free way it operates, and this unit looks like something of a bargain (in high-end terms at least).